Ballerina-Molina! Love it! Somehow I can't visualize it decked out in a little Tutu! 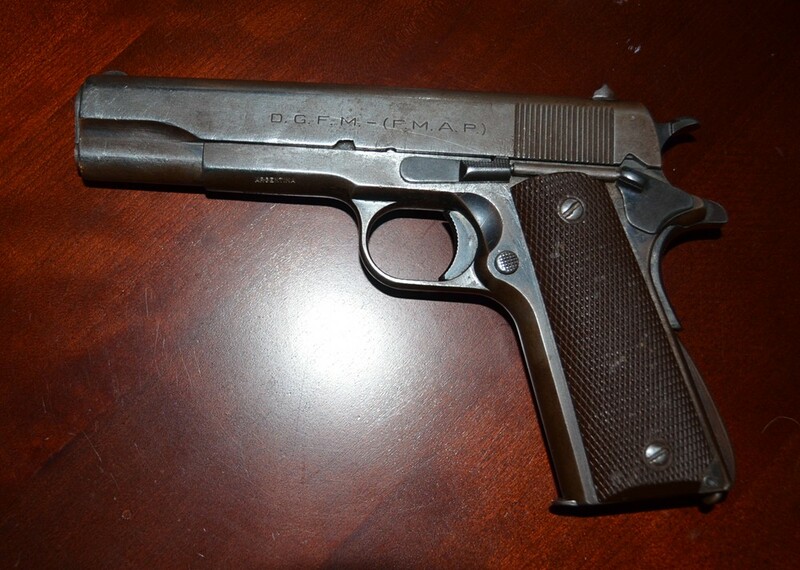 Argentine built Colt Model 1927 Clone, made in 1958. Despite the appearance it shoots pretty darn nice! I'm glad you managed to hang onto that info RWS. Many years and at least 2 computer crashes later and I lost all my old info on South American pistols. Most of the old S A firearms websites are no longer up and running either. ya done good! Nice looking pistol, it has that been there look, You know, it is amazing how many Balerter-Molina do look worked to death..
About 5 years ago SAMCO (I may be wrong on this) had some B-M from Perons body guard.. and they wanted like 1k each for them.. But those guns look like they had been through hell and back... Now stupid me you would think Body guard guns would be sparkling.. or at least look like police surplus firearms..
Ballesters and Sistemas were brought into the U.S. by more than one importer. Some importers brought them in as-is, with whatever remained of the original blued finish (which was often not much at all). Other importers chose to phospate them prior to importation. Since most of the pistols had seen far more handling use than actual shooting time you could get a Ballester or Sistema that looked very nice indeed but wouldn't necessarily function better or shoot more accurately than the finished-challenged ones. Collectors prefer the unfinished pistols; shooters probably prefer the phosphated ones. Either way, Ballester Molinas and Ballester Rigauds are every bit as good as a WW2 USGI pistol, and better in some ways. The miniscule sights are probably their biggest negative.